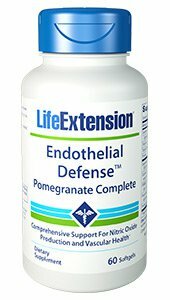 Endothelial Defense with Pomegranate Complete: Life Extension’s unique Endothelial Defense™ Pomegranate Complete formula combines pomegranate fruit extracts and seed oil, GliSODin® superoxide dismutase, and Cardiose® sweet orange peel extract: three powerful ingredients that have been shown to help protect the delicate cells that line the inside of your blood vessels. Pomegranate Complete is a potent source of unique polyphenol extracts from every part of the pomegranate, including the seed, flower, and fruit. Pomegranate extracts have valuable health benefits, including promoting healthy endothelial function; inhibiting oxidative stress; supporting metabolic and cardiovascular health; and encouraging a healthy inflammatory response. GliSODin® is an orally active form of superoxide dismutase (SOD) enzyme, a potent inhibitor of internal oxidative stress. In a clinical trial, daily supplementation with GliSODin® powerfully encouraged arterial health and significantly relieved oxidative stress compared to a control group. Cardiose® extract from sweet orange peel helps promote endothelial production of nitric oxide, which encourages vasodilation – a key requirement for healthy circulation. In a randomised controlled trial, 500 mg of sweet orange peel extract produced an 20% improvement in flow-mediated dilation, a direct marker of healthy endothelial function. This extract also promoted a normal, healthy inflammatory response. If you’re ready to give your cardiovascular health a boost of targeted nutritional support, add Endothelial Defense™Pomegranate Complete to your daily regimen! Take two (2) soft gels daily before breakfast, or as recommended by a healthcare practitioner.